BANJEURINE. SPECIALIST STRINGS FROM CLIFFORD ESSEX. This instrument has four double strings tuned the same as the mandolin and banjolin. 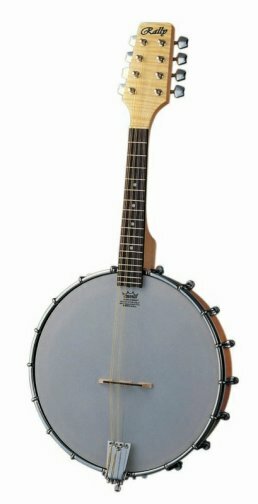 The banjeurine has five strings tuned: c. F. C. E. G. It was invented by the American manufacturer S. S. Stewart in 1885 and was evolved to take the lead in banjo orchestras of that period. In theory it took the soprano voice in the orchestra, its tuning is the same intervals as the banjo but tuned a fourth higher. The piccolo banjo was virtually a half size version of the banjo. Everything about it, size of hoop, length of fingerboard, scale length, was exactly half the size of the standard banjo. It was evolved by S. S. Stewart for use in the banjo orchestra and played the melody with the leading banjos but an octave higher. This instrument has six strings tuned E. A. D. G. B. E. It is virtually a six string banjo made to the scale length of the guitar. It is tuned to the same pitch as the guitar and medium classical guitar strings should be fitted. When the instrument is played with a plectrum, light gauge steel guitar strings should be fitted. Various tunings but the most popular is: g. G. C. D. G. B. D.
1859- Stephen Van Hagen patents 7 string (1 short) banjo with frets. PICCOLO BANJO. SPECIALIST STRINGS FROM CLIFFORD ESSEX. SEVEN STRING BANJO. TUNED: g. G. C. D. G. B. D.